Probes allow you to define rectangular prisms that you can use to focus on parts of a volume for further analysis and interpretation. You can create a probe on the IL/CL survey grids or X/Y coordinates. Using probes to restrict the volume to be processed is important for computationally intensive routines such as stacking, intercept/gradients and model building. In the Control Panel, open the Probe tab. At the tab header, click the Add icon and select New probe. Type a name for the new probe. At Survey, select the survey in which you want to create the probe. You will not be allowed to pick on a survey that is not assigned to the probe. For X/Y probes, select <X/Y> as your survey. Note: When you first create the probe, it starts with a default size around the current location. If you are unable to see it, try zooming in or out of the view. If you are still unable to locate it, check that the colour of the boundary is not similar to the background making it hard to see. In the Details Panel, select to use the time or depth domain to create the probe at the TWT (ms) or TVDSS (m) drop-down box. You can only create and edit a probe on the time/depth vertical axis. Note: The drop-down box is disabled in editing mode. To change the time/depth domain, exit editing mode by clicking on the pencil icon, or pressing the Escape key, or right clicking in a view and select Stop Picking. At Line, click to select a line colour for the probe and type the line thickness to represent the probe in the adjacent box. At the probe item row, click the Pick probe pencil icon to enable the edit mode for the probe in the 2D Line View, Arbline View, IL/CL View, Map View or 3D View. Alternatively, right-click the lines of the probe in any view to open a context menu and click Pick "Probe" to start editing the picking points. In the Map View, drag the picking points to resize the extent of the probe. Alternatively, drag the entire rectangle to move the probe to another part of the trace where you would want to constraint your analysis. If the probe appears as a dashed rectangle in Map View, it means that the current time/depth does not intersect with the probe. In the 3D View, the probe will appear as a cube/cuboid with cones on each face. Drag the cones to move the location of each face to the desired position. Alternatively, drag the entire cube/cuboid to reposition the probe. In section views (i.e. 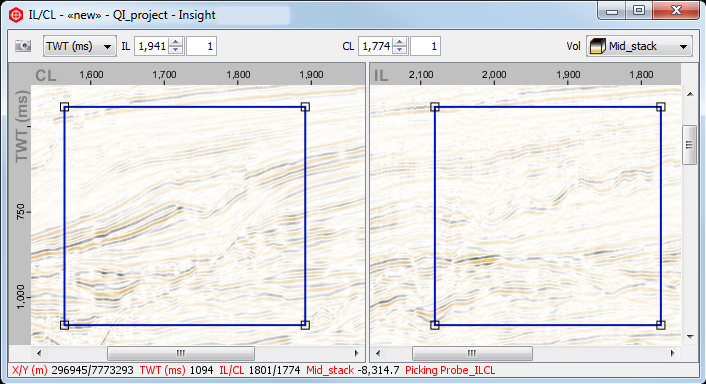 IL/CL View, Arbline View, 2D Line View), you can only adjust the picking points on the vertical axis (time/depth domain). Once you are satisfied with the probe, click the Pick probe pencil icon at the probe item row in the Probes tree to exit the editing mode. You can also right-click in the view to open the context menu and click Stop Picking Probe. The hotkey for stop picking is Esc. In addition to dragging the picking points in the views, you can also edit the probe by directly typing the values of the picking points in the Details Panel of the probe. To clip a volume to the probe in 3D View, click the 3D View Settings spanner icon at the navigation bar of the 3D View and select the Clip to probe check box to clip the data to the probe (see Defining 3D View Settings). You can also see 3D Volume Visualisation within a probe by selecting the Use Probe check box in the Volume Visualisation section of the 3D View Settings window (see 3D Volume Visualisation). Tip: Click the Zoom to view probe magnifying glass icon in the Volume Visualisation section and the screen’s center of rotation will be set to the probe’s centroid making it easy for you to orbit the 3D View around the probe.